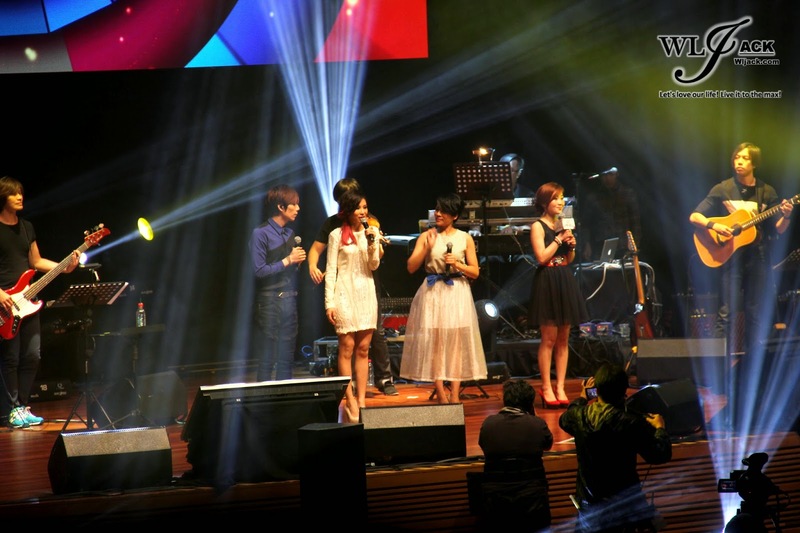 5th August 2014, Kuala Lumpur – A few days ago, our team from wljack.com has been given a chance to do a coverage on Taiwan Literature & Music Night 台湾文学之夜演唱会 which happened in Plenary Hall KLCC, Level 1 in conjunction with Bookfest @ Malaysia 2014. The show was hosted by MyFM DJ Phoebe! Learning Taiwan Literature Through Music! Being titled as Taiwan Literature & Music Night, it is a night which is a little bit different from usual concerts or music showcase. Instead of having the performers singing their own pop songs, the organizer has invited three spectacular singers, Freya Lim 林凡, Peter Pan 潘裕文 and Maggie Chiang 江美琪 to perform the song which are literature-related masterpiece! Maggie, Peter and Freya Presented The Classical Songs In Their Own Distinct Way! Elegant Maggie Chiang 江美琪 sang beautiful songs such as 但愿人长久 , 橄榄树, 忘了我是谁,被遗忘的时光, 对你而言 and 我是多么的羡慕你. She has mesmerized all of the audience with her great voice. On the other hand, Peter Pan 潘裕文 has also performed 旋木,红豆,东风坡, 风吹风吹, 看见那道光 and 夏雨诗. His unique voice has brought a different feeling to these songs. All of the audience enjoyed it very much. Last but not least, Freya Lim 林凡 who is from Malaysia sang a few songs too such as 偶然,明明爱你,岁月这把刀, 滚滚红尘 and 野百合也有春天. She has put on an amazing show for the crowd and everyone was impressed with her strong vocal. Encore! All three performers performed together! All of the performances were done solo by each of the singers. When the last performer Freya left the stage, Phoebe hinted to the audience that they should shout the universal words if they wanted to listen to more singing. All of the crowds shouted “Encore” along with the tempo created by the drummer. The three of the singers came back on stage and finally sang together on the same stage. They sang 朋友 and 分享 as their encore songs. Overall, I think Taiwan Literature & Music Night 台湾文学之夜演唱会 is a very good event to introduce to the public regarding Taiwan literature and how it is related to music. Through this music night, I realized that the lyrics for these classical songs are very beautifully written and everyone should try to appreciate it! Million thanks to Popular Malaysia for giving me a chance to do a coverage on this event.